The Leonard “Swanny” Swanson Memorial Pathway is a bike path between Memorial and Roosevelt parks in Rapid City, where there are quite a few walkers and cyclists passing by during the night. However, over the past years the path has been an area of high crime rates caused by aggressive panhandlers and vagrants. The local police were looking for proactive projects to make it safer there and create a more appealing corridor for walkers and cyclists. 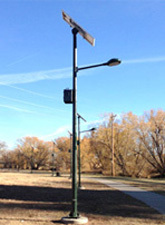 In April 2010, police officer Ryan Phillips, a member of the city’s Street Crimes Unit and one of the main participants in the project, was patrolling the area when he came up with the idea to add lights along the pathway to deter crimes. Then he spent almost 2-1/2 years pitching the idea to community and business leaders and finally saw his idea became a reality on Nov. 13, 2012. The cost was covered by private donation, public funding and in-kind contributions. The 58 solar lights built by Greenshine New Energy, which provide solar lighting solutions to the whole world, perfectly meet all the requirements for the project. “Solar power seemed like the best route for the project.” said Phillips, “The initial cost is more, but it’s a savings in the long run.” The solution is totally off grid and will ensure obvious savings on trenching, landscaping, maintenance costs and electric bills. In addition, the lights are designed with sufficient reservoir and will still come on for 7~10 days in cloudy days. Even in the worst situation, they would just dim a little bit. Greenshine New Energy specializes in developing and manufacturing customized solar powered lighting systems for a wide range of lighting applications. The main products are solar outdoor lights, such as solar street lights, solar garden lights and solar lawn lights, etc.. They are used in many college campuses and large corporations. To find out more about this company, please visit www.streetlamp-solar.com.